Stunning large natural shape sheepskin rug made from 10 premium pelts that have been expertly matched and carefully sewn together. 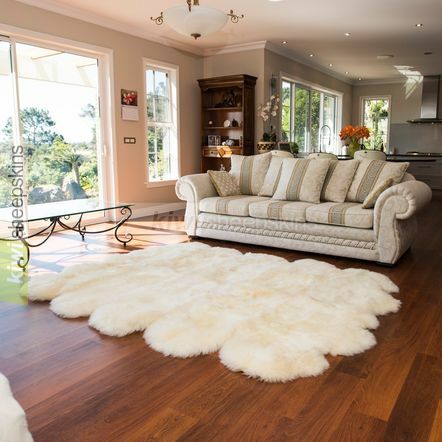 Top quality and absolutely stunning extra-large sheepskin rugs made from ten pelts and carefully crafted into one natural-looking centrepiece. No floor space should be without one. Delighted customer feedback relating to our 10 pelt sheepskin rugs. The rug [10 Pelt Ivory White] is Awesome!! Wow!! I just got it in the mail! Thank you soooo much!! It is Not too heavy on the bed, it smells SOooo good!! So soft and Beautiful!! It fits just right! Thank you soooo very much for all your advice and care!! Have a blessed day! Thank you so much for such a beautiful rug [10 pelt Sand]. The color is perfect and I couldn't be happier. Just wanted to thank you for your great service and absolutely beautiful product. I could sleep on the rug it is so soft. You will come highly recommended from us. (10-piece Grey Tip) rug looks great on our new wooden floor, colour matches our leather lounge perfectly. Thank you once again. I received my rug [10 Pelt Grey] in the mail today and it is beautiful!!! The [10-pelt] rug arrived this morning and it is beautiful! Thanks to your help and input it came out looking exactly as I hoped for! Thanks again I hope to be able to do business with you and your company in the future! I just wanted to thank you so much. I got my sheepskin [10-piece] in the mail today and it is wonderful. The shipping was so fast! My wife is going to be so thrilled. Thank you for getting this to me in time for Christmas. The customer service that I had with your company was incredible. Great customer service and great communication online concerning the orders. This is a rare thing today in many companies. Thank you so much. I just received my order [10-piece rug] and I must say that it is beautiful.